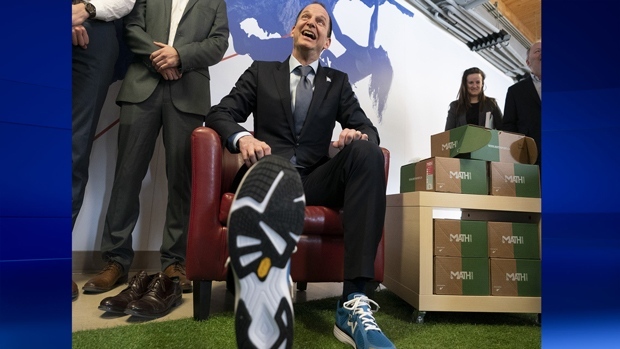 Thursday’s provincial budget will leave Quebecers with a spring in their step, according to Finance Minister Eric Girard, who donned a new pair of sneakers for the occasion. The CAQ will table its first budget, and to mark the occasion, Girard made a twist on the finance minister’s tradition of buying a new pair of shoes. Picking a pair of running shoes in CAQ blue from a local shoe company, Girard said he chose sneakers because Quebec has to pick up the pace to close the gap with Ontario when it comes to productivity and wealth. “Sports is part of the discipline that helps me work hard, and the small businesses are very important to the development and growth of Quebec. This is an exciting small business from Quebec City, so that was an obvious choice,” said Girard of the running shoes. Liberal finance critic Carlos Leitao had words of warning ahead of the budget. The PQ wants to see significant re-investments in critical areas, including a universal flat rate for daycare fees, money for crumbling schools and more nurses in hospitals and long-term care facilities. “We want the Legault government to make sure that after ‘cutting taxes’ promises, they will respect the second promise in the campaign: put some money in public services,” said PQ MNA Martin Ouellet. Meantime, Quebec solidaire is looking for measures aimed at protecting the environment, said MNA Gabriel Nadeau-Dubois. “We cannot do ‘business as usual’ politics anymore. We cannot do normal politics, and we can't have tomorrow a normal budget. We need an exceptional budget in the way that it has to be a budget to fight against the great threat of our time, which is climate change,” he said. The budget will be revealed at 4 p.m.